Nonios can defy top weight in the Bet quadpot At totesport.com Handicap at Chelmsford. He is taking on one of the stars of the all-weather season in King Kevin but the drop in trip may not suit Ed Dunlop’s prolific winner. As King Kevin won over a mile and a half last time out and he seemed to stay every yard of it, the 10 furlongs he faces here might be on the sharp side. Nonios, on the other hand, is more exposed than King Kevin but is in the form of his life for David Simcock. A winner over this course and distance in January, he has remained at the top of his game ever since and went down only by a short head last time out. Despite King Kevin’s fruitful spell, the only previous time he has run in this class of race he was put in his place so he will need to have improved again. The handicapper is struggling to keep up with Good Business and she can win again in the totepool Bets At totesport.com Fillies’ Handicap. Trained by Henry Spiller upon leaving Jeremy Noseda, she has won both starts for her new yard. Beginning her new spell off just 51 she won over six furlongs in January and then followed up a month later off 56. Now up to 63, she has the excellent William Cox taking 5lb off to offset her latest rise in the weights. Global Academy is a very good horse to be running for just under £6,000 in the Betway Novice Stakes at Wolverhampton. Gay Kelleway’s youngster ran off a mark of just 69 in December but wins at Chelmsford and Wolverhampton have seen his rating shoot up to 90. Six furlongs and Lingfield did not seem to suit him last time out, but back to the minimum trip – and Dunstall Park – he can regain top form. Michael’s Mount ran a very pleasing race last time out and he looks a cut above his rivals in the Windsor Clive International Novices’ Hurdle at Ludlow. A decent middle-distance handicapper on the Flat, he is now with Ian Williams and won at the first time of asking at Doncaster. Stepped up markedly in grade for the Dovecote Novices’ Hurdle at Kempton he finished a very fine third in one of the strongest races of its type outside of Cheltenham. Kerry Lee’s Tree Of Liberty should take some stopping in the Alfa Aggregate Products Novices’ Chase. 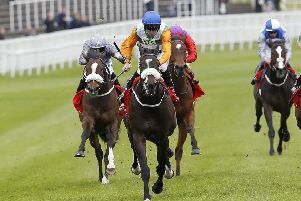 It will not be pretty at Chepstow given this is the second of a two-day meeting on heavy ground but Tom George’s Truckers Lodge may have bumped into an above-average type at Carlisle last time out. He was second to Ballinslea Bridge so he might be the one to be on in the ICB Waterproofing Novices’ Hurdle. CHELMSFORD: 5.45 Prince Jai, 6.15 Cecilator, 6.45 NONIOS (NAP), 7.15 Cainhoe Star, 7.45 Jungle Room, 8.15 Good Business, 8.45 Something Lucky. CHEPSTOW: 2.20 Under The Woods, 2.50 Kapga De Lily, 3.25 Truckers Lodge (treble), 4.00 Bears Rails, 4.35 Fly Du Charmil, 5.05 Repeat Business, 5.35 Destinee Royale. LUDLOW: 2.30 Michael’s Mount, 3.00 Tree Of Liberty, 3.35 Dans Le Vent, 4.10 Just Cameron, 4.45 Bear’s Affair, 5.15 Cyrius Moriviere, 5.50 Best To Come. WOLVERHAMPTON: 2.10 King Crimson, 2.40 Global Academy (next best), 3.15 Tha’ir, 3.50 Feel The Vibes, 4.25 Dragonite, 4.55 Widnes, 5.25 Wazin, 6.00 Kafoo.